50 Gram Scented Silica Gel Plastic Canister - Available In Apple, Lavender, Lemonade, Rose, or Vanilla. 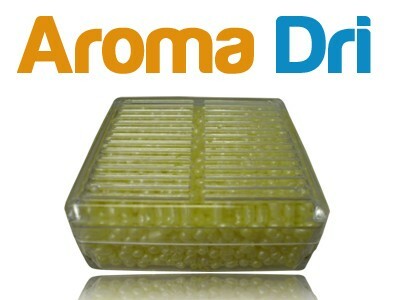 Aroma Dri™ Scented Moisture Absorbing Hard Plastic Canister Is Compact, Rugged, Portable, & Electric Free (NO CORDS)! 2 1/4" x 2 1/4" x 1"
Bathrooms, Closets, Dresser Drawers, Gun Case, Ammo Cans, Electronics, Camera Bag, Shoes, Tool Boxes, Cabinets, Drawers, Tackle Boxes, Backpacks, Camping Gear, RV's, Trailers, Storage Bins, Coin Collections, Craft Supplies, etc.